proTile Map Editor v2.0 is now LIVE! Different brushes – mass placement, all snap, paint. Objects of any size – snap any tiles anywhere. Runtime support – Create runtime building games, full API for customisation. 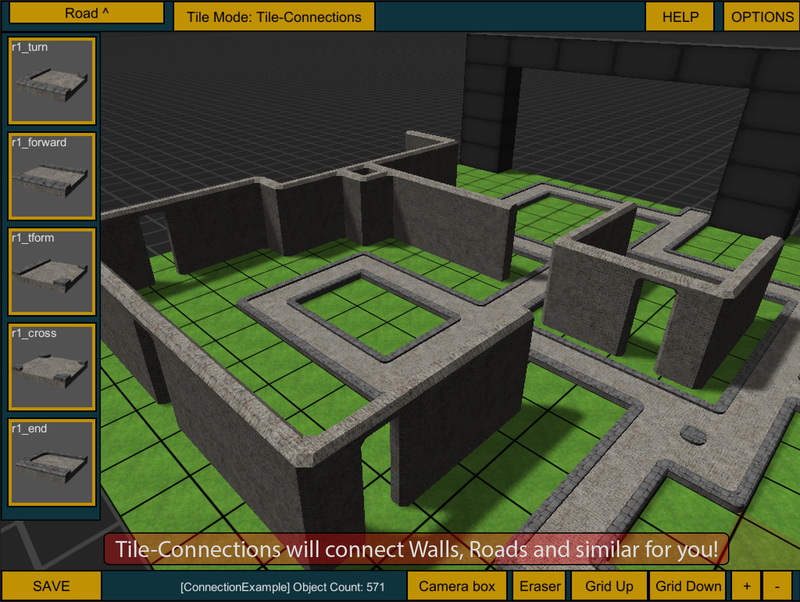 Tile-Connections – connect roads, walls and similar automatically. 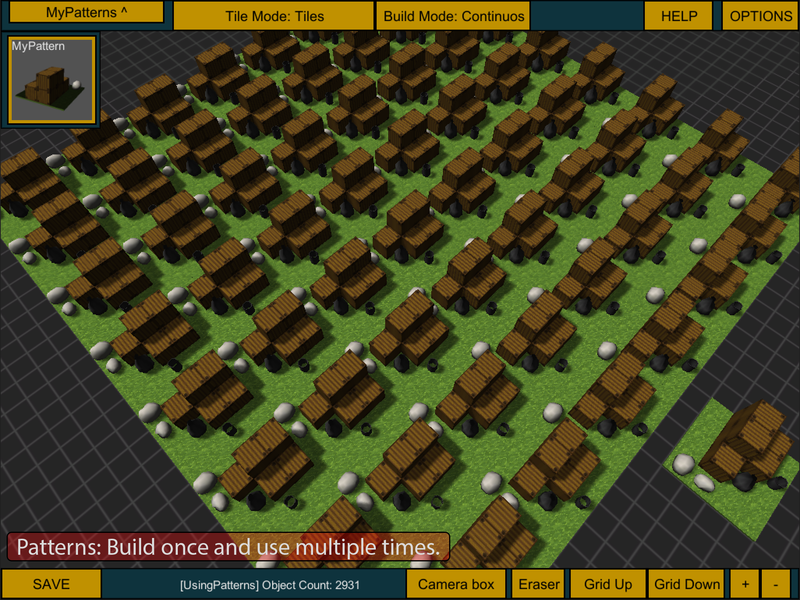 Custom Patterns – build once, place multiple times. 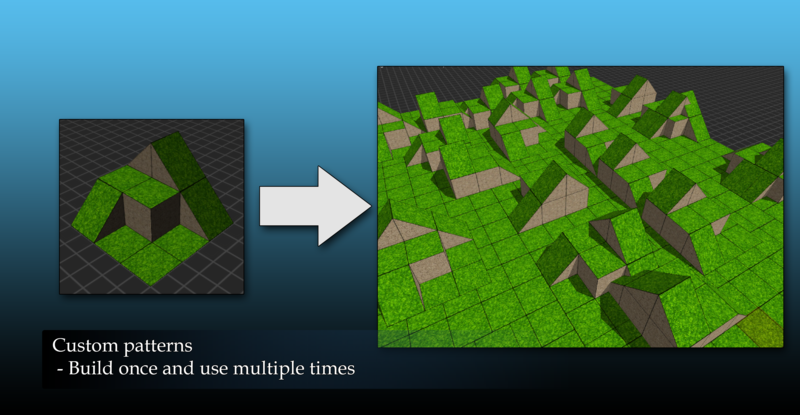 Performance and size optimizations – combines meshes, reduces size for you. Layers – will help you to manage your maps. 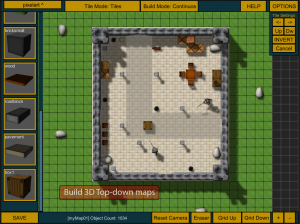 Easy to load and use – load maps in the editor, at runtime or stream dynamically. 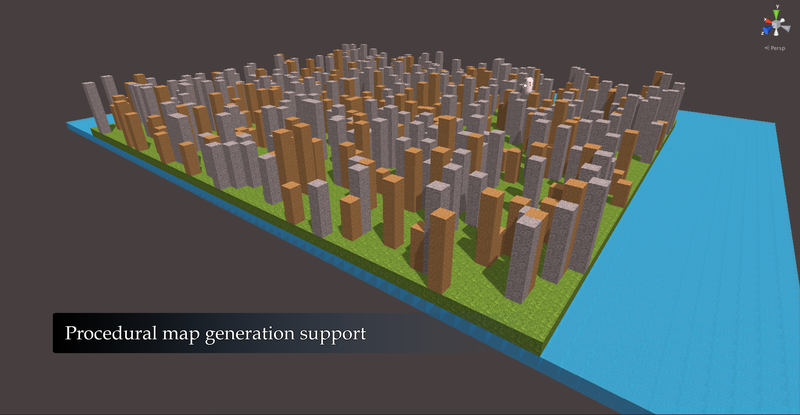 Procedural support – generate maps from code. 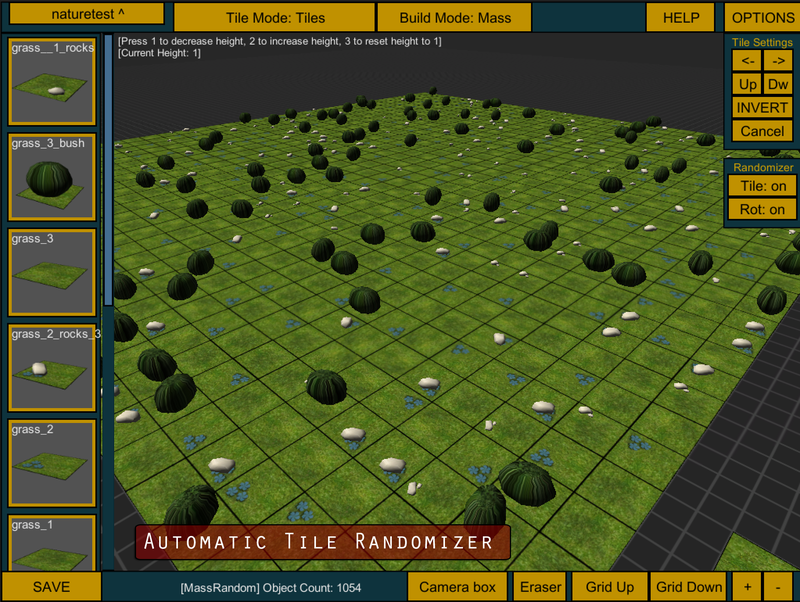 Tile randomizer – Auto tile and rotation randomization. 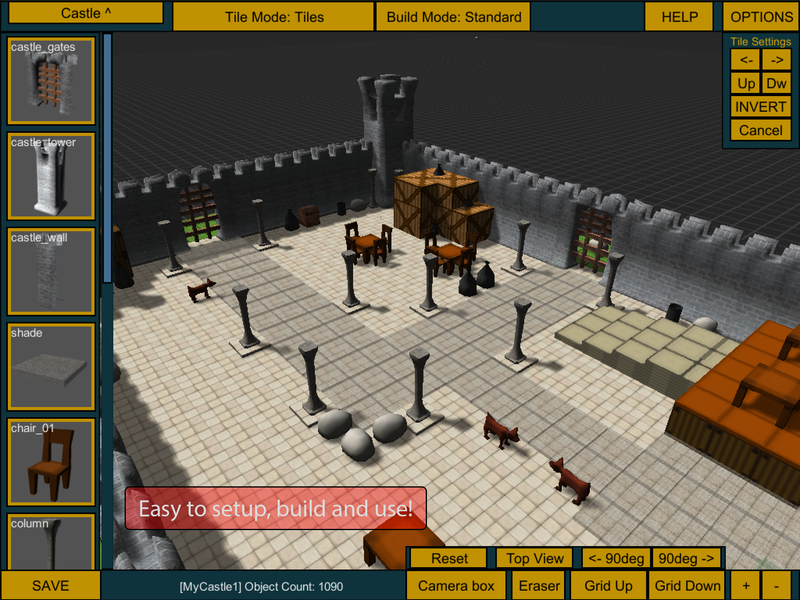 Different camera setups – Fits different 3D/2D type of games. 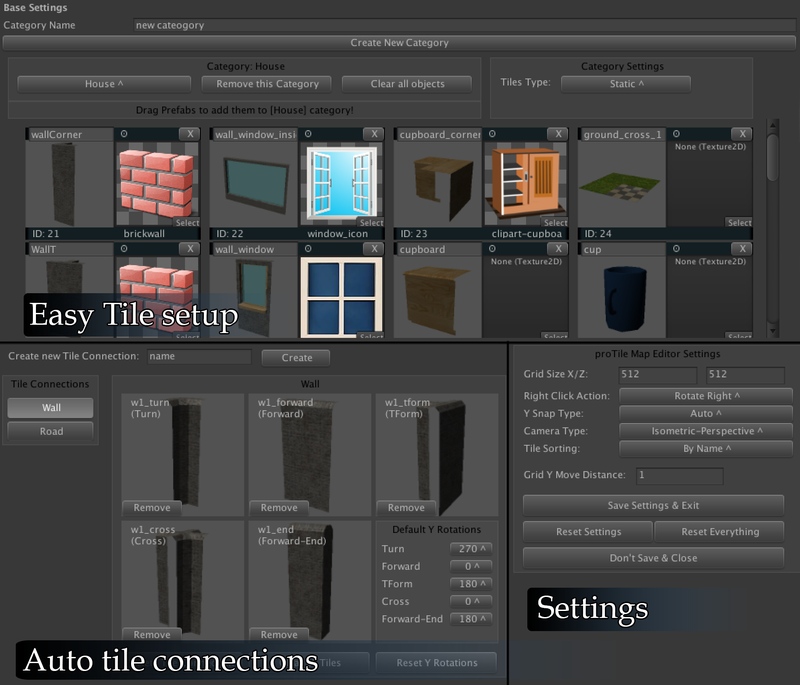 Editor for easy tile setup – categorise your tiles. Open source, examples, documentation and much more! 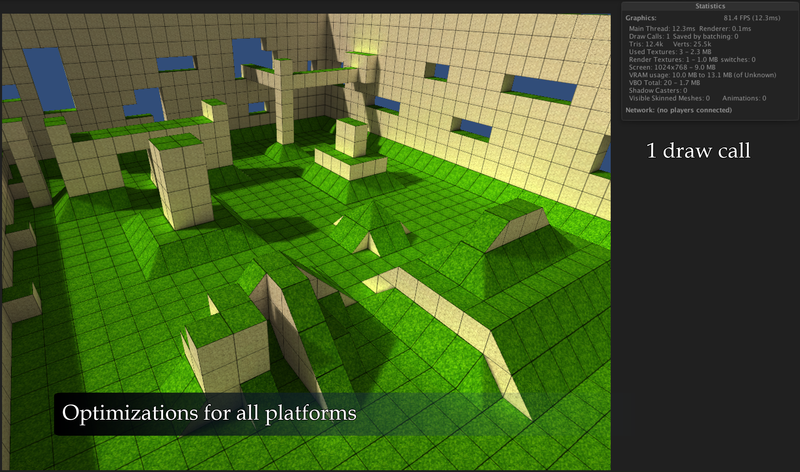 Supports Unity 4.6+ and Unity 5. I’m currently working very hard on releasing proTile Map Editor v2.0. I’m sorry if you didn’t have a decent update for a while now but I want for v2.0 to be great and it will be free for all 1.x owners. 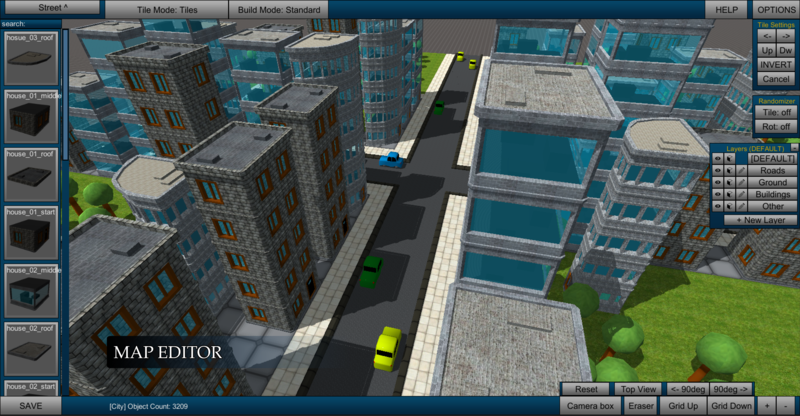 Runtime support – you will be able to use map editor functionality at runtime and with all exposed API you will be able to adjust it for your game. 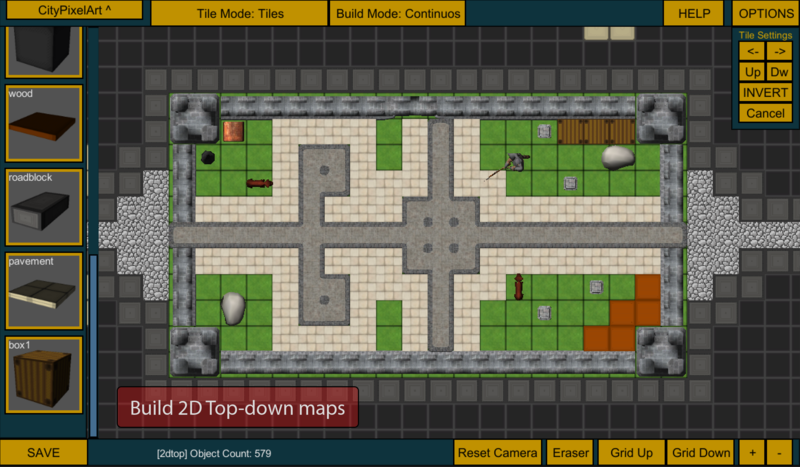 Layer support – you will be able to use layers for better map managing (layers work similarly like in photoshop). 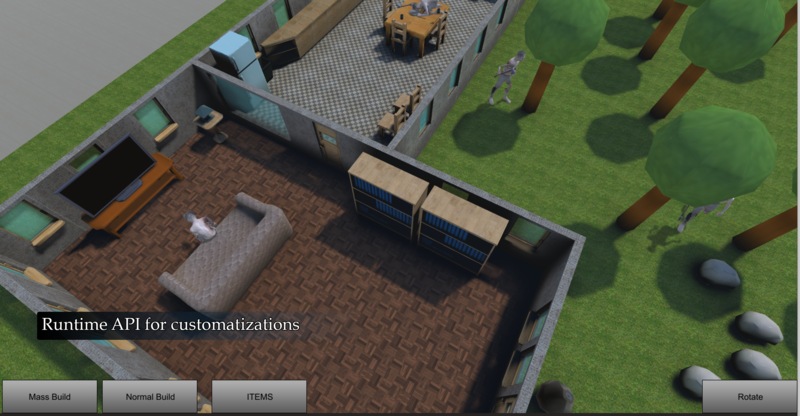 Custom Tile Preview – a feature for Runtime where you can define previews for each tile (imagine Sims where you have “inventory” for you build assets and they have separate preview image). A new a better UI. 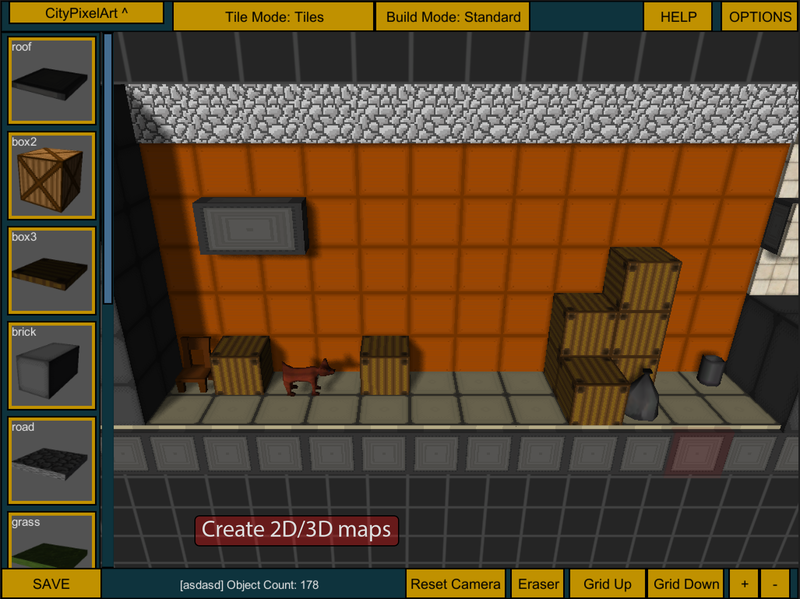 Loading map bounds (for visual help). 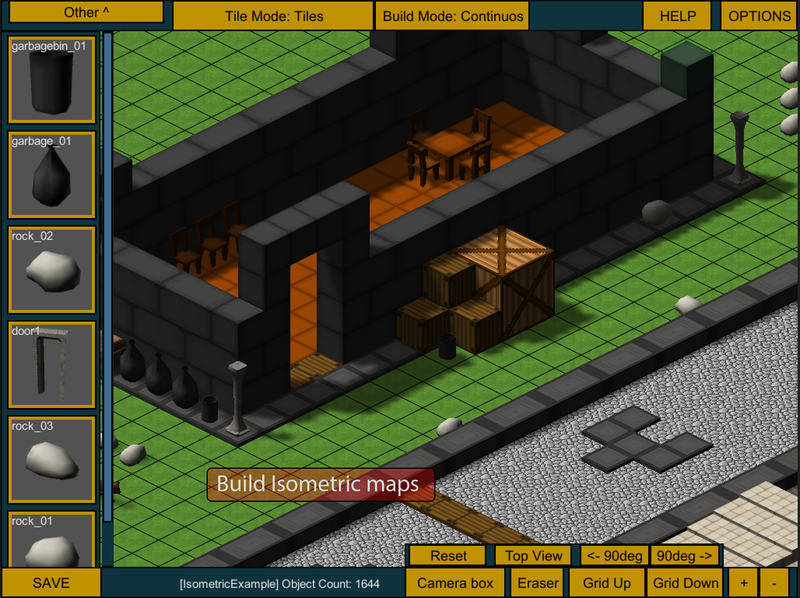 Create / Assign new tiles at Runtime. 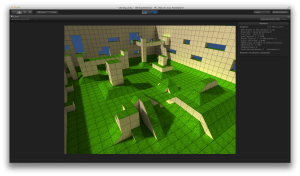 LoadMapAsync from point – load your map dynamically from given point. Lots of other improvements in different places and better functionality in general. 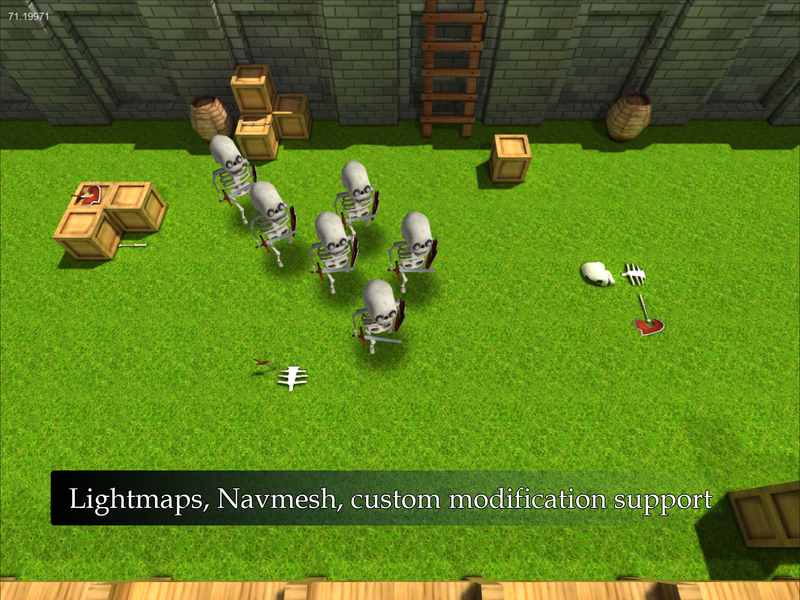 There are more features and ideas that I’m working for v2.0 (or v2.1) but I will announce them later. 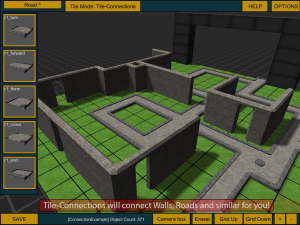 I’m currently running BETA 3 build and if you are interested in it please send me your invoice number from 1.x purchase to pro.andrius@gmail.com and I will send you proTile Map Editor Beta 3 Build. Introducing to new features in v1.4 update. 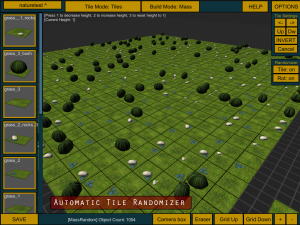 – Tile Randomizer. 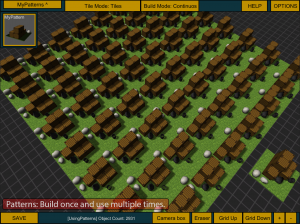 Randomize your tile prefabs / rotation when building. – New and better Mass Builder. Ability to mass build vertically. – Better support for Lightmaps. – New and better Eraser. – Define map scale when loading. – Better optimization and performance. – Better experience in general and other improvements (eg. 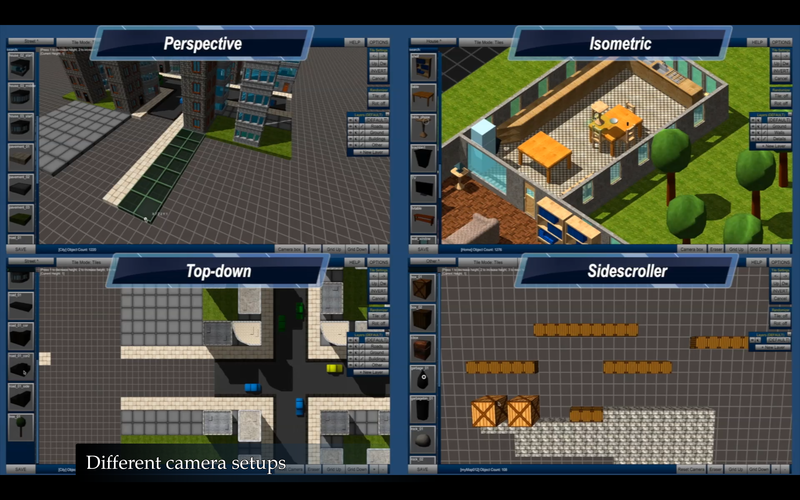 saving options, camera position, etc for each map). – Better support for 2D/Quads. – Very fast Editor loading. 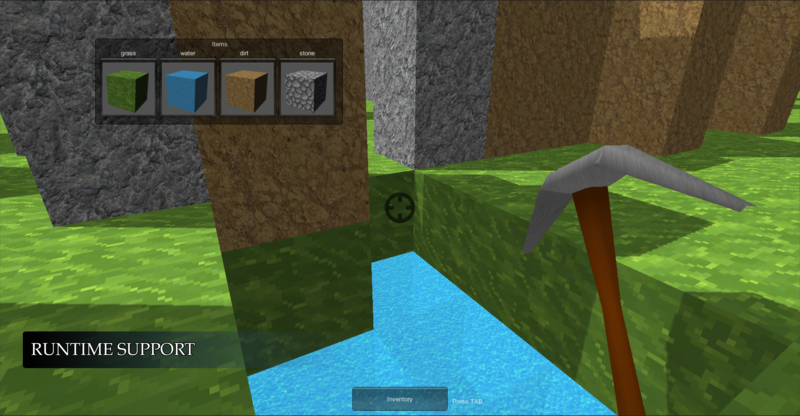 – Some bug fixes and other improvements.